OMNI FANDOM EXPO'S 1ST ANNUAL UV CARDBOARD MECH/MONSTER MAD SCIENCE CREATOR CONTEST! 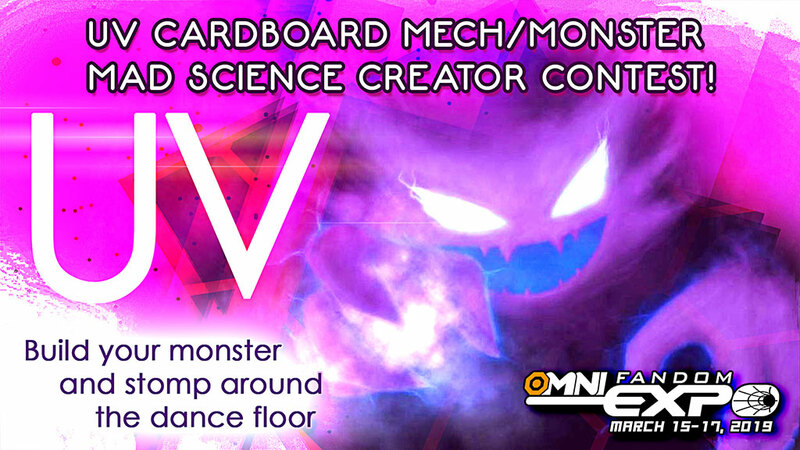 Bring your best (worst..lol) cardboard Mech/Monster covered in UV (black light) Paint and stomp around the dance floor! The costumes we like best win prizes! Let your inner glow monster out and tear up the night! What kind of materials can I use in making my Mech/Monster? As long as it's mostly made out of cardboard, you can also use paper, plastics, foam, and other materials. Can I build it at the EOL Club dance in Main Events? No. You may NOT built it during the dance. You may bring parts of it and put it on but you may not construct it there. Do I have to have glow in the dark stuff on it? Yes. This is a UV (black light) mech/monster contest after all. Does it have to be a Mech/Monster? Can't I just wear some glow in the dark stuff and use glowsticks? You can bring other creations or costumes, but we'll base our decisions off of if we think it fits the spirit of the contest. Can I put LED lights on my creation? Can I store my creation in main events during the day? We do not have room in main events to store your costumes during the day. You must bring your creation to the event and it must leave with you at the end of the event. Please do not leave your mech/monsters lying around after you leave. Thank you!